O God, who guided Saint Bridget of Sweden along different paths of life and wondrously taught her the wisdom of the Cross as she contemplated the Passion of your Son, grant us, we pray, that, walking worthily in our vocation, we may seek you in all things. Through our Lord Jesus Christ, your Son, who lives and reigns with you in the unity of the Holy Spirit, one God, for ever and ever. Patron saint of Sweden, Bridget married a young prince and lived happily with him for 28 years, bearing him eight children. St. Catherine of Sweden was their daughter. After her husband died, Bridget founded the Order of the Most Holy Savior, erecting at Vadstena a double monastery for monks and nuns. Following the guidance of the Holy Spirit, she later went to Rome, where she worked for the return of the Popes from Avignon. She died of natural causes in 1373, at the age of seventy-one. This Scandinavian mystic is famous for her Revelations concerning the sufferings of our Redeemer. According to the 1962 Missal of St. John XXIII, the Extraordinary Form of the Roman Rite, today is the feast of St. Apollinaris. His feast in the Ordinary Form of the Roman Rite is celebrated on July 20. It is also the feast of St. Liborius, the son of an important family in Gaul, who became Bishop of Le Mans and played a leading part in spreading Christianity in Gaul at the end of the fourth century. St. Bridget's feast in the 1962 Missal of St. John XXIII the Extraordinary Form of the Roman Rite is celebrated on October 8. Bridget was born in Sweden of noble and pious parents, and led a most holy life. While she was yet unborn, her mother was saved from shipwreck for her sake. At ten years of age, Bridget heard a sermon on the Passion of our Lord; and the next night she saw Jesus on the cross, covered with fresh blood, and speaking to her about his Passion. Thenceforward meditation on that subject affected her to such a degree, that she could never think of our Lord's sufferings without tears. She was given in marriage to Ulfo prince of Nericia; and won him, by example and persuasion, to a life of piety. She devoted herself with maternal love to the education of her children. She was most zealous in serving the poor, especially the sick; and set apart a house for their reception, where she would often wash and kiss their feet. Together with her husband, she went on pilgrimage to Compostella, to visit the tomb of the apostle St. James. On their return journey, Ulfo fell dangerously ill at Arras; but St. Dionysius, appearing to Bridget at night, foretold the restoration of her husband's health, and other future events. Ulfo became a Cistercian monk, but died soon afterwards. Whereupon Bridget, having heard the voice of Christ calling her in a dream, embraced a more austere manner of life. Many secrets were then revealed to her by God. She founded the monastery of Vadstena under the rule of our Savior, which was given her by our Lord himself. At his command, she went to Rome, where she kindled the love of God in very many hearts. She made a pilgrimage to Jerusalem; but on her return to Rome she was attacked by fever, and suffered severely from sickness during a whole year. On the day she had foretold, she passed to heaven, laden with merits. Her body was translated to her monastery of Vadstena; and becoming illustrious for miracles, she was enrolled among the saints by Boniface IX. St. Bridget founded the Order of the Most Holy Savior (Bridgettines) at Vadstena in 1346. It received confirmation by Pope Urban V in 1370, and survives today. The new branch of the order was refounded by Blessed Elisabeth Hesselblad and has grown substantially, around the world. Symbols: Pilgrim's staff, bottle and wallet; open book and dove; crosier, lute and chain; taper; heart charged with cross; book; head and cross; pilgrim's staff; shell. Often Portrayed As: Abbess in Bridgettine robes with a cross on her forehead, and holding a book and pilgrim's staff; nun enthroned, with Christ above her and hell below, while she gives books to the emperor and kings; nun giving a book to Saint Augustine; nun in ecstasy before the crucifix with instruments of the Passion nearby; nun reading, holding a cross, with builders in the background; nun with a cross on her brow witnessing the Birth of Christ (one of her visions); nun with shells (a sign of pilgrimage), sewn on her habit; nun writing with a pilgrim's equipage nearby; nun writing with an angel hovering over her shoulder, often whispering in her ear; nun writing with Christ and the Virgin appearing before her; small child at the Scourging of Christ (one of her visions). From the Catholic Culture Library, two articles by Pope John Paul II — St. Bridget: A Unique Model of Feminine Holiness, Three Co-Patronesses of Europe and Saint Birgitta. 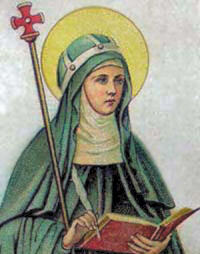 St. Bridget was a member of the Franciscan Third Order. If you have never considered joining one of the Church's order's for lay people today might be a good time to think about it. Learn more about becoming a secular Franciscan. You may want to purchase a copy of Revelations of St. Bridget on the Life and Passion of Our Lord and the Life of His Blessed Mother which contains excerpts from her revelations. You might like to read about St. Birgitta of Sweden's Influence in Finland. The Birgittine Order now has thirteen monasteries of contemplative nuns and a congregation of contemplative-apostolic sisters whose motherhouse is in Rome, in the actual former dwelling of St. Birgitta. For information about the sisters here are some websites: About the Birgittine Nuns in Vadstena, Birgittine Sisters, About the Brigittine sisters and SantaBirgitta.com. The Brigittine Monks existed from the 14th to the middle of the 19th century, when they were dispersed, largely due to European wars. (In 1970, a Brigittine Monk, Richard Reynolds, martyr, was declared a saint.) This monastery, the 1st in over 100 years, was founded in 1976 and has the Canonical status of a Priory “Sui Juris.” If you want to know about the monks visit Brigittine Monks of the Order of the Most Holy Savior. Read about the saints of the Brigittine order and more about Bl. Elizabeth Hesselblad who refounded the order. The Catholic Encyclopedia has this to say about the Brigittines. You may want to buy some delicious fudge made by the monks or puchase a Brigittine Rosary. Patron: Paderborn, Germany; Le Mans, France. Symbols: Book and several small stones; peacock; peacock's feather.